Slayer will be doing promo for a new comic book and BMX bikes at the Con, and they’ll play a show at House of Blues on Thursday. You don’t need a Comic-Con pass to enjoy these Con-themed music events around town. Darkwave Garden at the Bancroft has a costume dance party planned for Thursday, July 21, as do other weekend DJ events at the AC Lounge, Onyx/Thin, Bar Dynamite, and F6ix. Musical comedy duo Paul and Storm appear at the Balboa Theatre on Thursday for W00tstock 8.0: A Night of Geeks & Music. Slayer is the subject of a new biographical comic book, and the band is appearing at Comic-Con to promote their Cradle to Grave line of BMX bicycles, with a public performance scheduled for July 21 at House of Blues. Con attendees can meet Slayer the following day for a pair of signings at the Dark Horse booth (number 2615) and the Nuclear Blast Records booth (number 501). The San Diego Symphony will perform the music of video games on two consecutive nights at downtown’s Jacobs Music Center. On Thursday July 21, Final Symphony: The Ultimate Final Fantasy Concert Experience features the music of Final Fantasy VI, VII, and X by composers Nobuo Uematsu and Masashi Hamauzu. The event also includes a piano concerto based on Final Fantasy X arranged by composer Hamauzu, as well as a 45-minute symphony based on the music of Final Fantasy VII with conductor Eckehard Stier and pianist Katharina Treutler. Thursday, July 20, 2017, 9:30 a.m. to 7 p.m.
On Friday, July 22, the Jacobs Center will feature The Legend of Zelda: Symphony of the Goddesses — Master Quest, a multimedia concert experience that celebrates the 29-year-old gaming franchise with orchestral suites and synchronized video screen images. 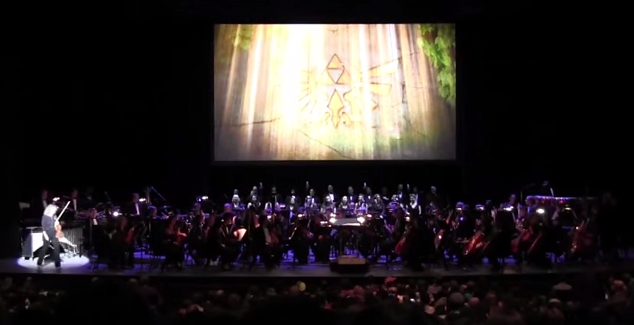 In addition to the show’s usual presentation, new music will debut from the most current Zelda game, Master Quest. DJs will spin at Heroes Brew Fest at Waterfront Park on Saturday, July 23. That night, the annual Comic-Con show by sonic superheroes the Aquabats happens at House of Blues, where Nerf Herder opens the colorful proceedings. On Sunday, July 24, Brick by Brick has the Cool Blue Comic Con, featuring art displays and music from Ashen Earth, Voices of Ruin, and Ratt Black. Over at the Kava Lounge, Comic-Con Club Works will include sets from Neuropunk (Juke Bounce Werk), TR-666, Black Bolt, Raw Kollage, and Dr. Techno, aka TESSIERI.